The holidays are coming! Is your kitchen ready? Find out my favorite items to use in your kitchen for the holidays, as well as my best family recipes. Are you overwhelmed by your children's school work and art? The kids have only been in school a little over a month and you are probably already inundated with piles of papers- homework, announcements, agendas and of course, all of their cherished artwork that you just can't part with. If you are lucky enough to have a child that actually cleans his/her backpack out and dumps everything on your kitchen counters, congratulations... I never did! Most of us have to sit down with our kids and help them go through their backpacks to decipher the plethora of papers. Add on the sports ribbons, trophies and awards and your home can be overrun with stuff! So what do I do with all of it???? Here are my Smart Organizing Solutionsto help with this overwhelming task. Here's my most important tip- don't feel guilty about throwing some of it away! Admit it- not every drawing or project is a timeless treasure. Take time each day or week to sit with your child and decide together what should be kept. Don't let things pile up so it becomes an overly time-consuming or paralyzing job. Ask yourself will keeping this for years to come bring me joy or will it be a burden? Will anyone ever take time to look at it again? Later in life, will you be foisting multiple boxes of paperwork on your kids for them to store? Limit yourself and your child to keep things that are truly worth saving- items that have special meaning and reflect your child's unique personality and growth. Once you have decided on the keepers, these are my favorite SOS to best preserve or showcase their memories. Use a cute burlap memory board to showcase your child's latest picture or good grade on an assignment. Display temporarily and then toss! 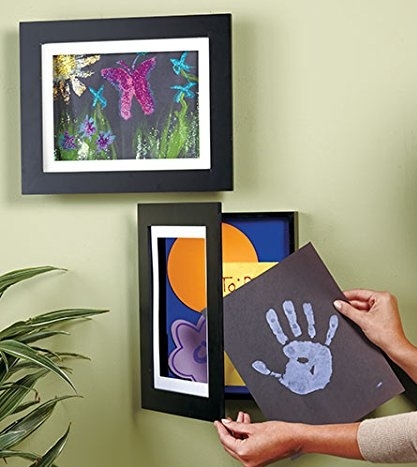 These cute, easy to change picture frames are sized specifically for kids artwork- just open the door and slide new drawings or paintings into the front pocket. They come with sawtooth hangers and can be hung horizontally or vertically. 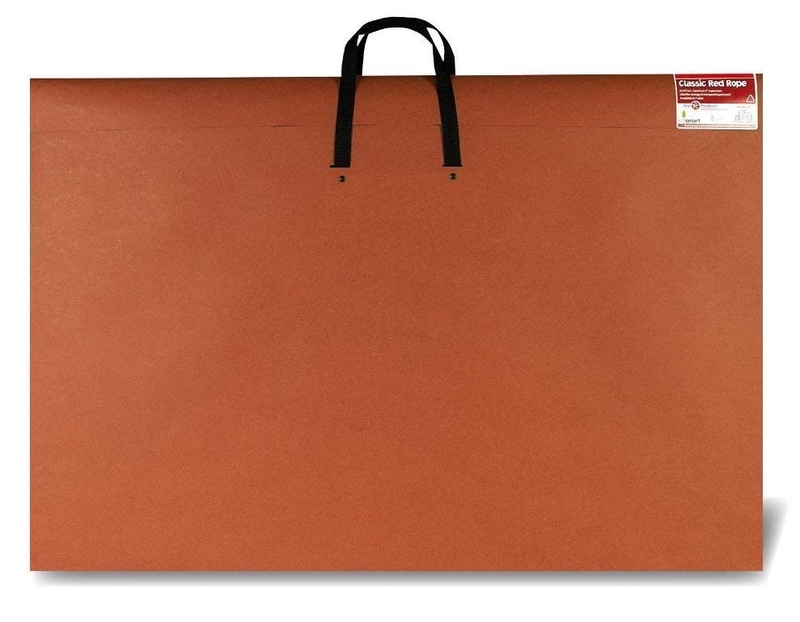 A sturdy portfolio is ideal for storing artwork. It's thin but made of a heavy-duty material to protect your documents long-term. And the handle makes it easily portable. 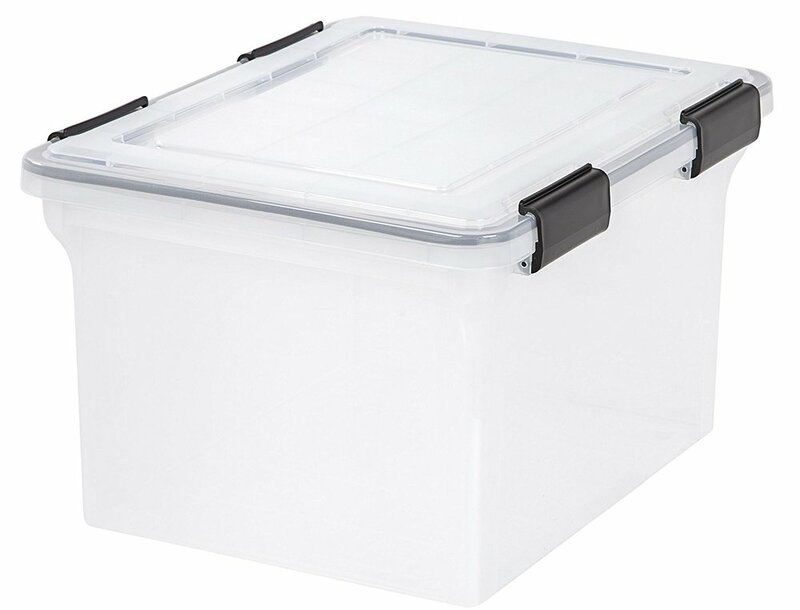 A weathertight filing box allows you to organize everything from year to year and protect it from dust and moisture. Just make sure you label the box so you remember what's in there! If you have several children (or are a little short on time), simply create a memory box for each child using a clear tote and label each box. Try to be selective with what you put in them and make sure to store in a location in your home where the contents won't be damaged or exposed to moisture. If you struggle to keep your closets tidy, you are not alone! Do you dream of the perfect closet? You don’t have to live with a chaotic closet. SOS can help! Got vacay plans? Don't stress over packing with our Summer Travel Essentials. Read about and see before and after pics for our latest project: moving from a large office space with no windows to a smaller office with one large window. It certainly posed its challenges! Read our August Newsletter. Did you know that Smart Organizing Solutions has started a monthly newsletter? Our August Issue is coming soon. If you’ve lived with your kitchen for a while, chances are you’ve got drawers full of stuff you rarely use and cupboards you hate. Wouldn’t it be nice to have a well-organized kitchen that makes food preparation a pleasure? Of all the organizing questions I get, how to handle the seemingly never ending piles of paper is the MOST common! Too often mail becomes a source of stress. Piles and piles of mail line table tops, counters, and nearly any horizontal space in the house. In sorting through the piles with my clients, I have found everything from birth certificates to checks for thousands of dollars that expired years ago. When mail isn't dealt with on a regular basis, important things get lost in the clutter. When any kind of paper comes through the door, make an immediate decision about it. Do not keep unnecessary receipts, invites or junk mail. Immediately transfer all important information to an agenda or phone! Sort through mail over a trash can, recycling bin & shredder. Whatever can go in there directly without being open - Should! When creating an organizing system ....make sure that its easy to follow! Complicated systems make it difficult to maintain and in time, we're back to trying to tame the paper monster! Welcome to the launch of our new blog! Our goal is to provide you with interesting and relevant information that makes you more productive and helps you create a life that is enjoyable! Here is a peek at our schedule! Mondays- "Simple strategies to cut the clutter"
Organizing and cleaning tips, ideas and products. Simple ways to be your best, find your strength and enjoy life! Highlights the services we offer, projects we are working on and special promotions and discounts. Simple tips to help you efficiently structure your time and home. Anything related to creating a beautiful home- furniture ideas, accessories and paint colors. Local events and information. As well as special holiday and seasonal discussions. We are excited to share this information and we think you will find it helpful as you juggle all that you have going in your daily lives. Stay tuned! As I walked the crowded mall this week, 70’s diva Donna Summer sang in my head: “More, More, More…” Do you ever feel that tis the season becomes tis the time to buy, gather, acquire? And with the New Year, you are faced with what am I going to do with all this stuff. We spend too much, enjoy too little, and end up paying for it over the next six months. The holidays shouldn’t be about getting or having, but instead about doing and being. This year, give gifts that won’t add clutter to the lives of loved-ones nor bury you in debt. Consider these ideas for clutter free gift giving: Give something really useful that you know an individual wants even if it’s boring to you. Try a consumable-a special wine, a gourmet olive oil, or homemade dessert. Better yet, give to a favorite charity in honor of that person who already has plenty. Give experiences instead of things: tickets to a concert, ballet, or sporting event. Or if your budget allows: a destination adventure to mark off your bucket list or a romantic getaway to a near-by spa. Give something only you can give. Online stores like shutteﬂy are great resources for gift giving- create a calendar for relatives with family photos. Solicit family recipes and compile a cookbook complete with sentimental photos. Give gift certiﬁcates: favorite eatery, specialty store, massage, pedicures or help get someone organized....A SmartOrganizingSolutions gift card! Remember- sensible gift giving means less clutter for the recipient and more enjoyment for you. As Donna also sang, “you work hard for the money” so make gifting count. Ready or not, the holiday season is here! In order to enjoy this special time of the year better, I recommend following the organizing tips below. Don't let a busy December create chaos and prevent you from experiencing the meaning of the season. Donʼt wait to the last minute to get gift ideas and make purchases. In the last days leading up to Christmas, do you want to be sitting by the ﬁre enjoying the tree or heading out to a crowded Sears to ﬁnd Uncle Tom his requested wrench set? Create lists of what you need to accomplish on a weekly or even daily basis. I prefer separate lists for all those important holiday items: errands, gifts to be purchased/ wrapped, Christmas cards, and holiday grocery. A detailed calendar is also a must for parties and school functions. We have all misplaced that one gift and realize it as we are loading the car already late to the party where it is to be given. By keeping all gifts in one location, like a bedroom or basement closet, you avoid the missing gift as well as repeat purchases (e.g. 2 striped ties for Dad). Where are the scissors? Are we out of tape? I canʼt ﬁnd the name tags. Dedicate one area of your home to wrap all gifts and maintain all supplies in that same place. Make this activity fun by involving the kids as your special helpers. I recommend keeping all gift receipts in one place. I use a clear zip envelope available at any ofﬁce supply store. You will want to label the envelope “Christmas 2012”. This tip will help eliminate the hassles of returns and exchanges. The holiday season is a busy time. It is my hope that these simple tips can eliminate some of the stress and allow you to enjoy the festive times. 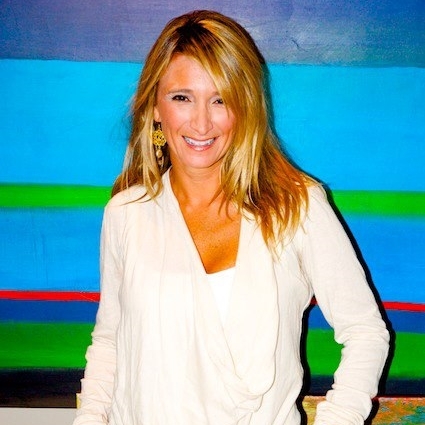 Patricia V. Sherrod Is A Proud Member of N.A.P.O. The National Association of Professional Organizers (NAPO) is a group of about 4,200 professional organizers dedicated to helping individuals and businesses bring order and efficiency to their lives. What began in 1983 as a small group of women offering organizing services in Los Angeles, now has grown into an international recognized group of professionals specializing in organizing the material things we hold dear in our lives.